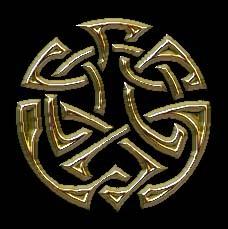 Most of these knotwork circle designs are JPEG images, and have a solid color background of white or black. Near the end of the group there are some GIF images with transparent backgrounds; these will work over a variety of background colors. Celtic Knotwork Borders in Repeating Sections is a collection of original Celtic knotwork border designs presented in a way that's meant to allow artists the freedom to create knotwork borders in virtually any size, and practically any shape, that they want. When you buy the book, the designs are free for unlimited use within your own projects, both private and commercial. The only restriction on these rights is that you may not reproduce the pattern parts themselves, outside of your original art, for redistribution. The designs on these pages are all copyright Bradley W. Schenck, 1997 & 1998, but may be used without fee by individuals for non-commercial web projects. If you're building your own web site, and you don't make money from the site, feel free to use these designs. If you are profiting by building a site for someone else, do not use them. If you are creating your own commercial site, do not use them. If you want to use one of these designs as a tattoo, a stationery design for your personal email, or want to make an object for your own use (not for sale) using one of these designs, go ahead. It is specifically prohibited for anyone other than the artist to include these images in a collection of clip art, whether for profit or not. Got it?